Olympic gold medallist Jessica Ennis said she would like to be an X Factor mentor - but Sir Chris Hoy and Bradley Wiggins are not as keen. Some amusing stories in press about me being a mentor on X-Factor; that's the first I've heard about it! #dontbelievethehype! It follows similar reports at the weekend which suggested double Gold medallist Mo Farah was being 'wooed' by show boss Simon Cowell. 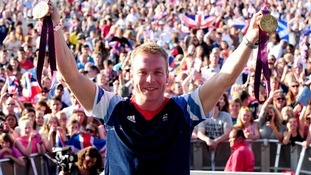 Sir Chris Hoy has posted photographs on Twitter of British athletes at a party last night celebrating the end of the Games.